Midnight Sun Reports Additional Drill Results from Solwezi Property – Midnight Sun Mining Corp.
Vancouver, British Columbia, February 12, 2014 – Midnight Sun Mining Corp. (the “Company” or “Midnight Sun”) (TSX-V: MMA) announces further drill results from the initial reverse circulation (“RC”) drilling program on the Solwezi copper property in northwest Zambia. The initial Solwezi drill program was undertaken in late 2013 and consisted of 1,700 metres drilled in 16 holes. 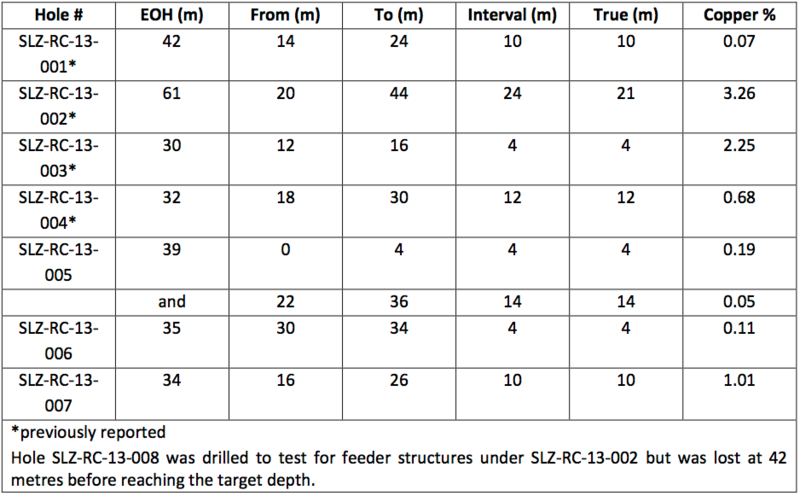 The following table summarizes the results of the 8 holes drilled to date on the 22 Zone on the Solwezi property. These results confirm the presence of high grade, near surface copper mineralization at the 22 Zone. The copper is mainly in the form of malachite, a mineral often associated with acid leaching operations. All assays in excess of 2% were tested for acid solubility and these generally exceeded 95% acid soluble copper. High grade copper samples are being re-assayed for gold content. The Company considers the 22 Zone to be an attractive target for further work, with the Zone remaining open in three directions, and located within 15km of First Quantum Mineral’s (FQM-T) Kansanshi mine – the largest copper mine in Africa. Midnight Sun plans a follow up program, scheduled for Spring 2014, consisting of additional core and RAB drilling that will focus on identifying the feeder zone structures of the copper mineralization. The remaining 8 holes in the Solwezi Northwest program tested geophysical and geochemical anomalies several kilometers from the 22 Zone and did not return significant results. The Company’s recently published technical report on the Solwezi property entitled “Technical Report on the Geology and Exploration Summary of the Solwezi Group of Prospecting Licences,” prepared in accordance with NI 43-101, is available on the company’s website here, as well as on www.sedar.com. All drilling was carried out by Layne Drilling, a world leader in RC drilling, and assaying was completed by Genalysis Laboratory Services, an accredited lab located in South Africa. Qualified Control/Quality Assurance: Samples obtained during the RC drilling were collected in two meter intervals and riffle split twice. A 3kg sample was then taken for chemical analysis. Samples were transported directly to Genalysis Laboratories in Chingola, Zambia by Midnight Sun personnel for sample preparation. Samples were sorted, dried, crushed, and pulped before being sent to Johannesburg, South Africa for final chemical analysis using ICP-MS methods. All samples returning >10,000 ppm Cu were automatically re-checked by Genalysis. In addition, samples taken from holes SLZ-13-RC-001 to SLZ-13- RC-004 were also analyzed for Acid Soluble Cu. Genalysis is a fully accredited Laboratory and sample duplicates, standards and blanks were inserted by Genalysis and verified by the qualified person. Qualified Person: Adrian Karolko, P.Geo, a Qualified Person under NI 43-101, has reviewed and approved the technical data and contents of this release.